Patrick is joined by Erich Asperschlager for a discussion on The Muppet Movie, The Great Muppet Caper, The Muppets Take Manhattan, Jim Henson, nostalgia and what makes those puppets so special. Mahna mahna. Great show. I agree with the praise for Back to the Future, for me it’s one of a handful of perfect films. I also agree that the third film is the weakest. That’s not to say it’s outright bad or anything just nowhere near the quality of the two that preceded. A really nice discussion of the Muppet films, but it’s a shame you spent no time on The Muppet Christmas Carol. I know it doesn’t truly compare to the early films but I have a huge soft spot for it. I’m really looking forward to the new one, but will have to wait till next year for it to be released in the UK. Also, I’ve never liked Miss Piggy too. Regarding the discussion about Tarantino, I watched Pulp Fiction for the first time in ages recently and found it dragged quite a bit, and I’ve had no desire to re-watch Reservoir Dogs for a long time. I’m looking forward to Django Unchained, but I’d love to see him do something like Jackie Brown again, where he’s contained a bit by someone else’s story and characters. Great show as always. I also grew up around the Muppets and feel that there's just something special about the original three films that I don't think will ever come around again. 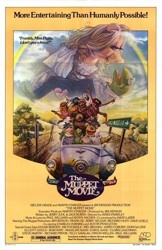 I'm going to differ a little with the consensus on the show though -- I don't know why, but I've never cared as much for The Muppet Movie as the others (although Manhattan has faded on me a little over time). It could be that there is a thread of evil in the original film that isn't there in the others. When I was little, I remember being creeped out by the Mel Brooks scene and the frog bounty hunter (though I think the fact that he even exists is hilarious now). This will sound really nitpicky, but I never liked how they handled the resolution of the Doc Hopper story either. It seems like the writers couldn't figure a way out, hence Giant Animal (and the four-foot prune). This isn't to say by any means that it's a bad film. On the contrary, I'm looking forward to showing my daughter all three when she's older. I also love some of the running gags they set up -- the sign on the church that mentions the Reverend Harry Krishna and they whole "Myth" one with Carol Kane as well. Though my favorite of all is still the "Red handed" joke from Caper (What color are their hands now?). I'm NOT as big a fan of Muppet Christmas Carol, but I REALLY love the Muppet Family Christmas special. We wore out the VHS recording of that one in my house when I was a kid (careful of the icy patch!). Good stuff, effers. I enjoyed this walk down memory lane, especially since it came two days after seeing the new Muppets film with my 5 year old step-daughter. As always, I think I enjoy things like that more than she does, but she did have a really good time, and we left the theater singing Manah Manah. I can't wait to hear what you guys (Particularly Patrick) thought of this new one. Isn't it interesting that some of the best movies of the year have been all ages/family friendly fare? Winnie the Pooh and now this have been two of my favorites of 2010. I've not yet seen Hugo, but I hear that it is also pretty great. Anyway, this podcast brought back memories of looking at the Muppets in 3D on my Viewfinder, watching Muppet Babies on Saturday morning, and enjoying reruns of the Muppet Show. It's good to have the Muppets back. I like the element of actual unapologetic menace that runs through the original Muppet Movie. That's something that made the kids' movies of the '80s so good that's mostly missing today -- they weren't afraid to be kind of scary, but it was always the good kind of scary (except for Return to Oz, which was just terrifying). Movies like The Dark Crystal and Time Bandits really got this, and that's part of why we remember as well as we do. I think, anyway. Interesting that we all have different takes on the BTTF sequels. I won't really argue that anyone's opinion is wrong, because they're such different movies. The important thing to remember is that we're debating which one comes a DISTANT, DISTANT second to the original, what with it being the best movie ever made and all.